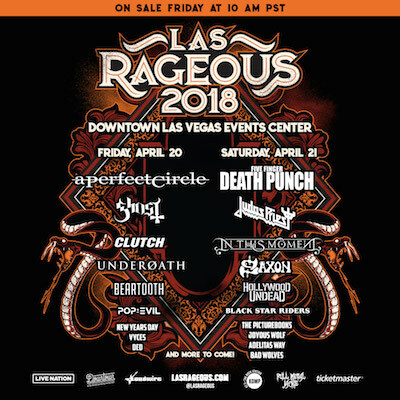 Five Finger Death Punch guitarist Zoltan Bathory exclaims, "We heard this year's first ever Las Rageous festival was a blast — we are excited to headline it in 2018! 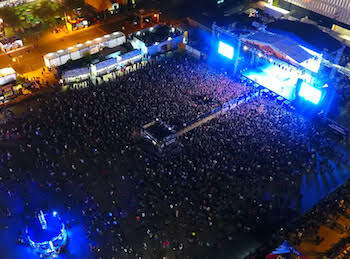 We love playing shows in our own backyard. Get Ready Vegas!" A Perfect Circle vocalist Maynard James Keenan says the group is "Looking forward to playing material from the new A Perfect Circle release at Las Rageous. Bringing new songs to life in a live setting is always exciting." Kurt Melien, president of Live Nation Las Vegas says, "Las Vegas is home to an incredible history of rock and metal music, and we love that we have the opportunity to put local talent in the spotlight, including one of our headlining bands, Five Finger Death Punch." "We are thrilled to have Las Rageous return to the Downtown Las Vegas Events Center," adds Derek Stevens, CEO of Downtown Las Vegas Events Center. "It was a huge success last year and played a key role in positioning Downtown Las Vegas as a true entertainment hub within our city." A Perfect Circle, Ghost, Clutch, Underoath, Beartooth, Pop Evil, New Years Day, VYCES, and DED, with more to come. Festivalgoers can expect to hear fan favorites and possibly new music from Sin City mainstay and Saturday night headliner Five Finger Death Punch, who just released their greatest hits album, A Decade Of Destruction, on December 1. A Perfect Circle—featuring Billy Howerdel, Maynard James Keenan, James Iha, Jeff Friedl, Matt McJunkins—headline Friday night with an eclectic set that may include their new single, "The Doomed," their first new song since 2013, which will appear on their upcoming 2018 album. The diverse music lineup ranges from NWOBHM legends Judas Priest and Saxon, to the spectacle of Ghost and In This Moment, metalcore heavyweights Underoath and Beartooth, up and coming blues-rockers Joyous Wolf and The Picturebooks, and more. Early bird tickets will be available starting on Wednesday, December 6 at 10:00 a.m. PT, for those who purchased tickets to last year's event. Unique codes will be provided from Ticketmaster via email this Tuesday. Live Nation Entertainment (NYSE: LYV) is the world's leading live entertainment company comprised of global market leaders: Ticketmaster, Live Nation & House of Blues Concerts, LN Media and Artist Nation Management. Live Nation Las Vegas produces residency shows from Britney Spears, Jennifer Lopez, Lionel Richie, Backstreet Boys and Pitbull at The AXIS at Planet Hollywood Resort & Casino; Bruno Mars and Ricky Martin at the Park Theater at Monte Carlo; and Il Divo, Rascal Flatts, Styx & Don Felder, Chicago and Earth, Wind & Fire at The Venetian Las Vegas. Live Nation Las Vegas also brings other world-famous artists to many of the city's other premiere concert venues including T-Mobile Arena, Mandalay Bay Events Center, MGM Grand Garden Arena, Las Vegas Village, Pearl Concert Theater at the Palms, House of Blues, Downtown Las Vegas Events Center, The Joint at Hard Rock Hotel & Casino Las Vegas, and more. For additional information, visit www.livenation.com. Find Live Nation Las Vegas on Facebook, Instagram and follow us on Twitter.